Moksa doesn’t have a star in the hall of fame of restaurants like Locavore but it is a promising heir to the throne of Ubud’s best eats. It is a plant-based restaurant that can impress even a stubborn carnivore. 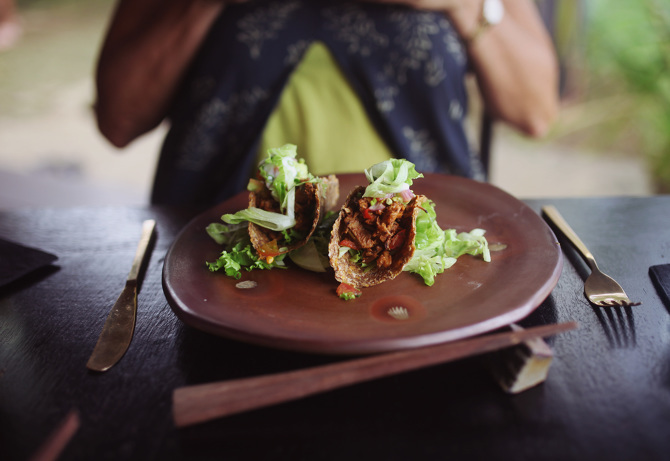 Ubud has a lot of healthy food options but Moksa is different in the way it offers raw and holistic food. It has a peaceful garden, away from the hectic city center. The ingredients come from their garden which is near the restaurant. They are open from 10 am to 9 pm but the kitchen closes at 8.30. They also offer raw cooking classes every Wed and Fri. If you are going there the first time, offer the sampling plate you see in the photo above. 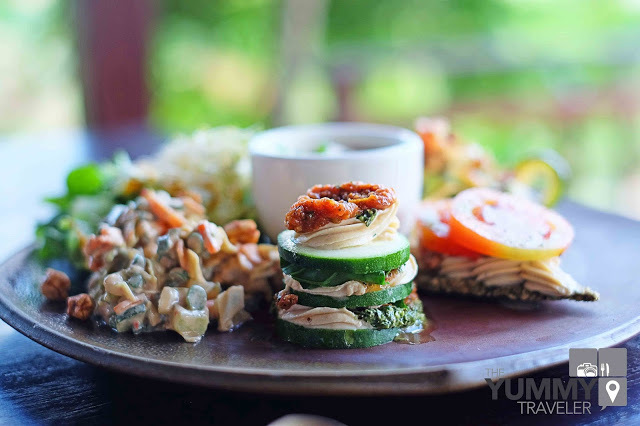 Ubud is like healthy food heaven with many restaurants that offers raw, as well as vegan and holistic food. Moksa Ubud is a fantastic choice for people who want to escape the hustle of Ubud and find some place relaxing, peaceful, quiet and seriously good food. Here at MOKSA, it`s all about enjoyment. Every product we develop first has to satisfy our own demanding criteria in terms of sustainability, freshness, and flavor. Our menus are freshly prepared with love and heart. It all stems from the concept of freedom that has propelled the creators of this restaurant, Made Janur Yasa and Chef Made Runatha, to idealize their hopes and vision. No more fears or destruction imposed on our environment when food is served on our plate. Mendengar istilah makanan vegetarian, persepsi sebagian besar dari kita adalah cita rasa yang kurang sedap. Bayangan yang muncul adalah hidangan seperti salad atau sayur mayur lainnya yang membosankan. Tapi pandangan itu berubah drastis setelah saya bertemu dengan Chef I Made Runatha yang menemukan seni memasak makanan berbasis tanaman menjadi hidangan yang lezat mendegut liur kita. This would have to be our favourite place by far! Sadly we only discovered it the day before we left but we still managed to squeeze in a second visit. Honestly, it was some of the best (healthy and organic) food I’ve had since being vegan. The chefs there are so skilled and add so much flavour into their meals and drinks that we were just blown away with. If we were forced to choose one restaurant to eat at forever, this would be our pick. From impeccable customer service to the breathtaking farmland, everything about Moksa is mouth-watering worthy. When you can see the soil that grew the food on your plate you’re tasting more than the chef’s creation. During lunch, you can see the farmers collect eggplant as you scuff down Eggplant Rendang. During my recent trip to Bali I had the pleasure of visiting Moksa, a plant-based restaurant in Ubud with a permaculture garden. 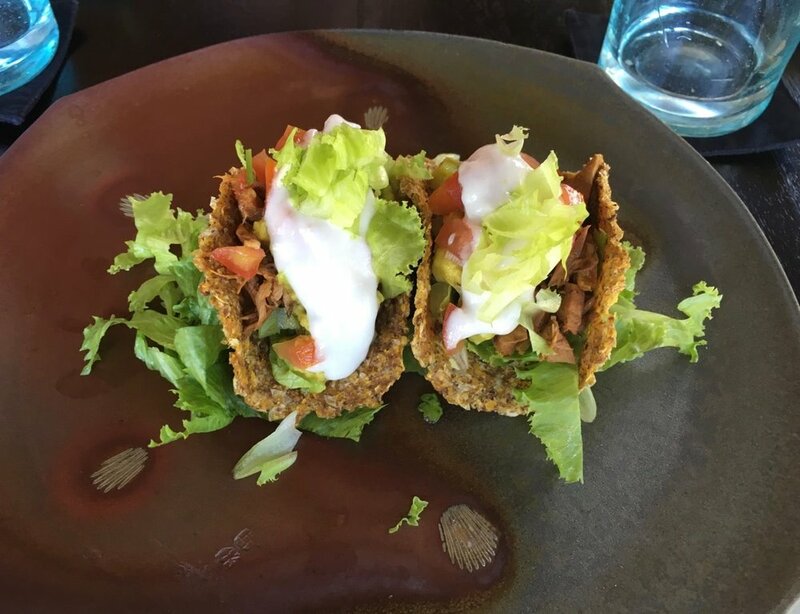 Recently opened 5 months ago by joint owners Janur and chef Made, as I arrived I soon realised that this restaurant is about a lot more than just the delicious raw and cooked vegan food they offer. Their whole ethos centres around their permaculture garden and using seasonal produce from this garden on their menu. You can forget food miles, as a large part of your meal here will have only travelled a few metres to arrive on your plate; literally from garden to table. All of the photos in this post are completely unedited, to show just how amazing the food and the scenery really are. 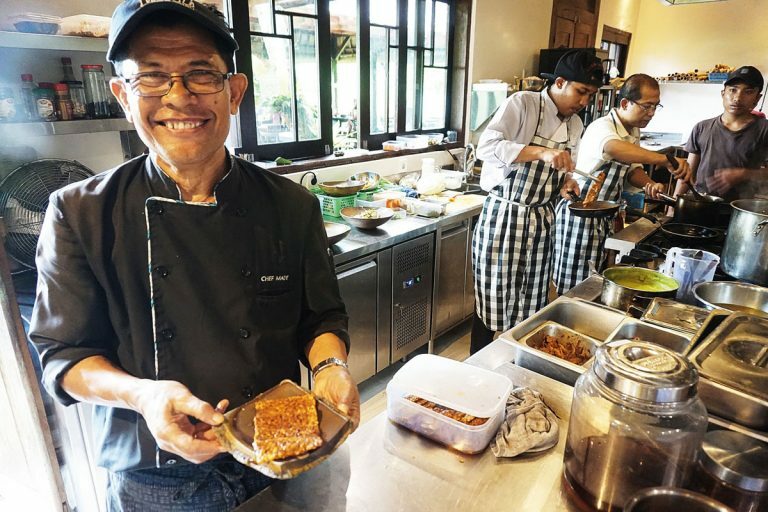 The raw food revolution has been taking over Ubud as of late with a slew of new restaurants opening up around town offering vegan, vegetarian and plant-based cuisine. We have to admit, we’ve never been huge fans of raw food. It just seems like all the dishes are the same—think some variation of sliced vegetables and cashew cheese presented somewhat beautifully but oh-so bland. However, our recent trip to Moksa may just have turned us around on the whole raw food thing.